The Facebook messenger update which was under testing on Android and iOS has now gone live and is available to all users to download. This new messenger update will bring refreshed looks and various other changes to enable FB messenger to be a more integrated part of your chatting experience. The most significant change in this new messenger is that it allows you to message every one in your contact list who is using the FB messenger, even if they are not in your Facebook friend list. This enables FB to compete head on with popular messaging Apps like WhatsApp. 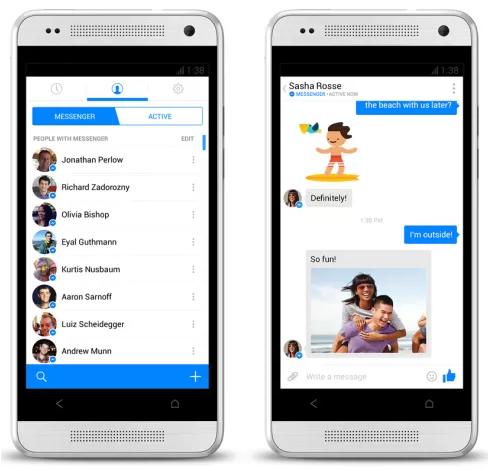 The FB Messenger is now closer to being a viable alternative t to the SMS app. When you download the app, it will ask for your active phone number and scan your contact list. You will see a Messenger icon resembling lightning bolt along with the pics of those using the Facebook messenger. The new messenger also allows you to directly view the Facebook timeline and profile of people added on your contact list and using Facebook messenger. Most mobile users have Facebook on their smartphones and this is the right move to translate the success on the FB desktop platform to the Mobile platform. You can download the update from Apple App Store and Android Playstore.